It turns out that there really is a strong food-mood connection. Have you ever been at a party and sampled a new dish so deliciously tantalizing that it instantly lifted your spirits? Well, it turns out that being pleasantly surprised by the taste of something can completely change your mood, calm your nerves and relieve aggression. And if you stick with me, I’ll let you know which rich, creamy, low-fat food product research shows will make you feel happier overall! So how does food affect your mood? I stumbled upon a study published in the journal Food Research International. It was conducted by an international team of researchers to see how food impacts emotions. They learned some pretty cool stuff about food and mood, but there are two major things I learned that I’d like to share with you. The first is that trying new foods can play a role in happiness; so if you always eat the same things then it might be time to have a little more fun. The team noticed that when people were pleasantly surprised by the taste of something, their moods improved—whether or not they knew what it was. On the other side of the coin, if they were disappointed by the taste of something, their moods got a little worse. So, you know what? If you eat something new that disappoints you, try something else. Keeping a healthy, diverse diet is what’s important! Vanilla Yogurt: The New Anti-Depressant? The research team also found that vanilla yogurt in particular evoked feelings of happiness. More so, low-fat vanilla yogurt left people with stronger, positive emotional responses. 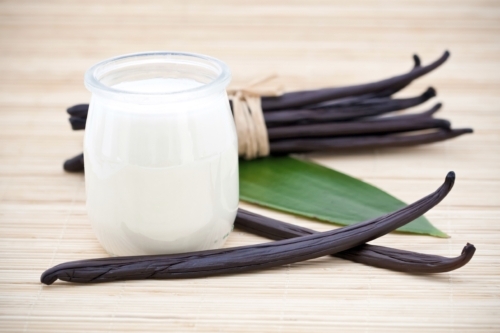 Research shows that vanilla—not solely just the yogurt but the scent itself—can be a key way to calm nerves, improve mood, and encourage positive thinking and harmony. If you don’t like the smell of vanilla, clementine is a fragrance that’s shown to improve mood and happiness as well. So if you’re in need of a brief pick-me-up—especially on one of these long, late fall or winter nights—try sipping on vanilla-infused tea, burning a vanilla-scented candle, or indulging yourself with a low-fat vanilla yogurt to help improve your mood and reduce stress. I would advise against eating too much vanilla yogurt, though. It’s a great mood-boosting food as long as you don’t go overboard. The stuff is laced with sugar that can lead to some associated health problems, so eat it sparingly—no more than one serving per day. You can also surprise your taste buds every once in a while to improve your mood. Head to the grocery store and pick up things you’ve never tried before. There has never been a better selection of fruits and vegetables available year round, and new recipes abound online. Keep things fresh and exciting and pleasantly surprise your taste buds into happiness! Mojet, J., et al., “Are Implicit Emotion Measurements Evoked by Food Unrelated to Liking?” Food Research International, 2015; doi:10.1016/j.foodres.2015.06.031. Warrenburg, S., “Effects of Fragrance on Emotions: Moods and Physiology,” Chemical Senses, 2005; 30 (suppl 1): i248-i249. doi: 10.1093/chemse/bjh208. Brazier, Y., “Eat vanilla yogurt, be happy, says research” Medical News Today web site, November 14, 2015; http://www.medicalnewstoday.com/articles/302573.php.